355 Eglinton Street, corner of 41 Devon Street, Glasgow. There has been a public house on this site from the 1880s, owned by renowned publican Duncan Cameron. 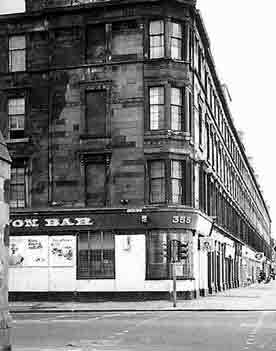 Mr Cameron was also landlord of the famous southside bar which is now known as Neeson's in Allison Street. In 1885 Duncan Cameron was living at Levenside Villa, Albert Road, Crosshill, and continued to serve the locals here until 1897. The new landlord John Neish took over the licence on April in the same year. Mr Neish was a wine and spirit merchant trading from 102 Norfolk Street at the corner of Portland Street and lived at 81 Waverley Gardens, Crossmyloof, Glasgow in the southside of the city. John Neish had a special Old Highland Whisky called 'Clan Neish' and the was was then called "The Eglinton Arms Bar." Mr Neish continued as licensee until 1903. The licence was then taken over by Agnes McNeish in the summer of that year and continued until after the First World War. Mrs McNeish was paying an annual rent of £60 for the pub. In 1921 Agnes Innes Dunlop Neish Steel was licensee, she took over from her mother then James Steel was licensee Mrs McNeish's son-in-law. The pub was then in the same family for 20 years. Another well known publican to run this popular bar was Peter Smith, he lived at 29 First Avenue, Netherlee, and ran the pub in the 1930s. The pub was still in the same family in the 1960s when Sheila MacCallum Smith was licensee. In 1963 the licence was once again changes, John S Donaghie took over the pub and continued until the pub was finally demolished in 1981. Jack Donaghey was given 48 hours notice to vocate the premises, a shock to anyone's system. He also owned a pub called the Mill Inn on the other side of Devon Street. Thanks to Jack Donaghey's son Raymond. Mr John Donaghey, A McAulay, Pig & Whistle and John Waterson, Burns Howff. 1970. Gorbals group photo 1974. The image includes Mrs M Malarkey; Charles Sweeney; Michael Heraghty, convener and Mrs Heraghty; G Watt (Bell's Whisky); E O'Doherty; Mrs O'Doherty; H Gallagher and Mrs Gallagher; J Donaghey and Mrs Donaghey. The Devon Bar on the extreme left with a view of Eglinton Street. 1960s. Left to right J McCormack (Harveys); Mrs McCormack; J Park (Harveys); Mrs Park; John Donnachie; Mrs Donnachie; and Mr T S Candlish (King George IV). 1970. This group photograph was taken during the Glasgow Vintners Golden Jubilee dinner dance in the Bellahouston Hotel, Glasgow in 1970. Included are Mr. John Donnachie (The Devon Bar); Mr. J. McCormack; Mr. E. Mulgrew, Dewer's; Mr. T. M. Park (J. & R. Harvey). 1973.